Hydrocal is the perfect 3-D canvas. Floquil Paints, Flo-Stains, Badger Air-Opaque, Floquil Polly-Scale, oil color, watercolor, ink washes, acrylics, artist's dry-pigments, colored pencils all work: try different things, experiment and develop your own favorite techniques. These castings are offered to you in fresh White Hydrocal much like a brand new canvas just prepared by the artist with a coat of Gesso that is nothing more than chalk and glue. Just about any coloring medium will work once you perfect the technique. If you are used to working with plastic or urethane you can seal the Hydrocal castings and it will be just about the same. Or you can experiment with stains, thinned paint or dry-brushing techniques. It's up to you. Generally, I recommend sealing the castings first with Scalecoat Sanding Sealer and then staining them with Floquil colors as described below. Use proper ventilation and care as described with those products. The castings will be both darker and duller without sealing. When sealed, a little of the white comes through and it's a shinier. I just like the way it looks. Note that it is best to do all your cutting, shaping and filing before you apply a sealer or finish as the castings will become stone-like after such applications. My method of mortaring the brick is only somewhat effective on stone as it tends to fill in the texture detail. It works well in some cases. For further details refer to the Coloring Brick Clinic. Allow Floquil paint to cure. Mix a little Durham's Water Putty with a gray ink wash or lampblack artist's dry-pigment and work it into the mortar lines. Wipe off the excess with a damp clothe and polish the surface with your finger. More often I just use a simple ink or gray-brown watercolor wash.
Seal, paint with 50/50 mix of medium gray (SP Lettering Gray for instance) and white (Reefer White) Floquil paint. Paint some stones with darker gray. Then highlight individual stones with Walnut, Teak, Maple and Mahogany Flo-Stains (see note below). Weather with gray watercolors or ink wash worked down into mortar lines. Stone Culverts, Abutments, Piers, etc. Flash needs to be removed and some fitting is necessary to allow interlocking. Do not force them! Gently work them together and note where they bind, file or trim with your hobby knife until you have a nice fit. No sealer is necessary. Paint with thinned (50%) wash of earth tone (gray, brown, tan, etc.) Floquil paint mixed with lots (75%) of White as a base. Vary tones. Use other colors or Flo-Stains to highlight. Stain the colored stone with a gray ink wash. Or apply a light gray watercolor wash just along the mortar lines. Dry-brush techniques can be very effective too. Testor's Corporation not so recently bought the Floquil brand line of hobby paints. Not that they are the best or only paint around, many of us have taken to using them. With the buy-out two things immediately happened- the prices doubled and what's much worse- they dropped the Flo-Stains entirely. I really liked the Flo-Stains. In fact, I still use them, what's left of my supply. Maybe if we all wrote to complain... though they didn't even bother to reply to my sugar sweet letter. And I went to high school with Fred Testor! Be nice about it but tell them you really miss the Flo-Stains like I do. Well, that didn't work so, what are we going to do? I remembered that Floquil used to advertise Danish Oils, which were compatible with their paints. Why not? Why not indeed? I bought a small can of Minwax 209 Natural - Wood Finish and mixed it with various colors of Floquil paint for my stains. It seems to work marginally. I don't know about the shelf life. It did look a little weird. I also tried a 50/50 mix of Testors Dullcoat and Floquil Gloss, mixing that with a small amount (10-120 percent) of regular Floquil paint. This seems pretty close and better shelf life so we are on the right track. Maybe you can improve on this. Minwax (and other brands) offers a wide variety of stains so maybe you could skip the Testors/Floquil all together (we'll show them!). It is reported however, that such stains do not perform well on sealed castings, so you might skip sealing, or find an alternative base. I'm also very pleased with some of my results (not all!) using CHEAP acrylics like Delta Ceramcoat and others found at craft store (like Michale's). You get 2 oz. for a dollar. You'll have a hard time convincing me that Floquil acrylics are any better at several times the price. Just add water. I use these without sealing. You'll have to experiment and develop your own techniques with some of these alternatives. Still, it would be so much easier if Flo-Stains were still around! I just don't understand those guys. 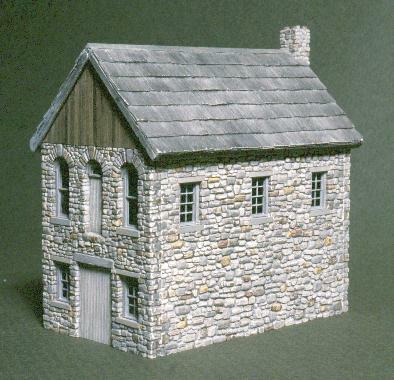 Check out my Durango Roundhouse model. I've loaded a bunch of pictures showing these in action. 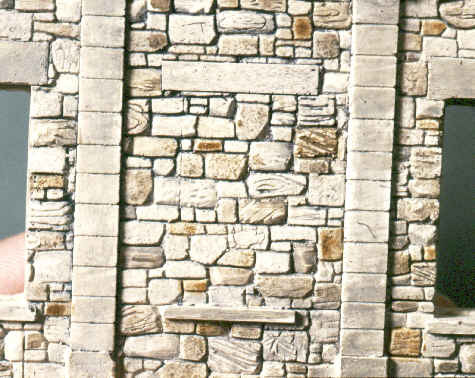 Close up of my Stone Engine House stone work. This is real simple. You'll need an ink wash and some artist's dry pigments.